One of my favorite parts about snow storms is the calm that comes after. It's always quiet, serene, and peaceful! Mike and I love to take Libby for a walk post snowstorm before the trails have been walked on and the roads are back to blacktop. While we (thankfully) didn't get hammered with snow from Jonas over the weekend, we did get a few inches, which made for the perfect midday walk on Monday! It was warm, sunny, and absolutely beautiful! I was actually standing on a small pond in these photos and the sun coupled with the white snow and open field, made it SO warm. I was in heaven 'cause #seasonaldepression. 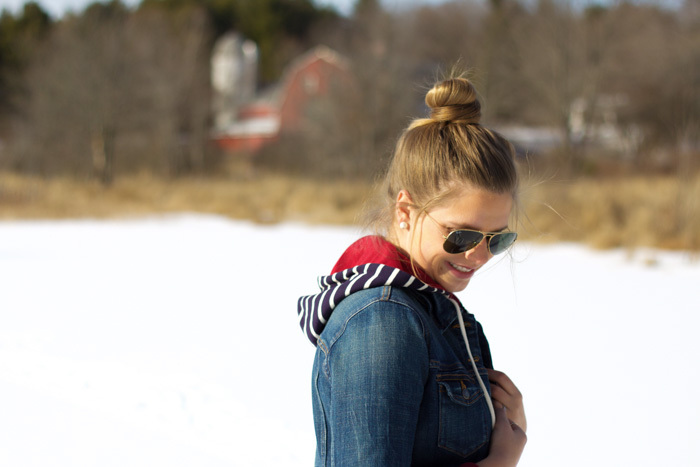 I received this sweater for Christmas and immediately loved the nautical feel it had and while a nautical vibe might not instantly scream "winter", I loved it paired with my go-to jean jacket and snow boots! It kept me perfectly warm for our snowy walk!